While it wasn’t exactly a case of ‘A Star is Born’, 21-year-old Claudio Coviello was certainly given a golden opportunity when Ivan Vasiliev couldn’t go on at La Scala last night. Coviello had learnt the role of Quasimodo in Roland Petit’s Notre-Dame de Paris for just a single matinée performance. The evening spots were taken by Roberto Bolle, Massimo Murru and Ivan Vasiliev. Except for Murru this was début time for everybody. Vasiliev, made-up and ready to take on the role for the first time, as well as making his first appearance at Milan’s famed opera house, was limbering up on stage half an hour before the curtain. Landing after a jump he felt pain in his back, and after quick consultations with specialists, it was decided that he couldn’t go on. Coviello, who had danced his unique scheduled performance that afternoon, and was hanging around to see Vasiliev in the role, was hurriedly ushered into make-up to prepare in the 25 minutes remaining before the start. There can’t be a worse feeling than hearing an audience cry out in disappointment when your name is read out as the star’s substitute, and the courage to go on and prove that the ticket was still worth the price is a talent in itself. Coviello proved that he was indeed worthy of the role, and played it with technical precision and commitment to the acting. 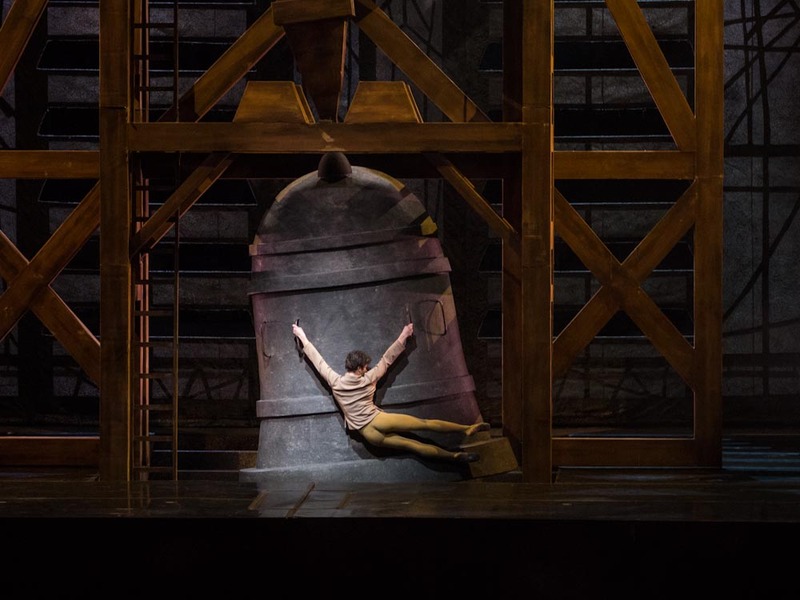 Petit’s stylised hunchback choreography becomes just a series of eccentric contemporary dance moves without a true interpretation of character, and Coviello, while not having fully mastered a command of the stage, demonstrated that he should be given more opportunities to shine. Unfortunately, the La Scala ballet company doesn’t have the frenetic schedule of the ABT or Mariinsky, and its dancers get precious few moments on stage where the real business of communication through dance can be developed. Petra Conti, his Esmeralda, had already danced with Murru, and rehearsed with Vasiliev, but never with his substitute. It didn’t show. She was strong and touching as the love interest of several men, and has a beautiful line, expressive legs and feet, and impressive balances. She also deserves more stage time! Eris Nezha, who we’d already seen on opening night, was an assured and technically formidable Phoebus, the vain Captain Esmeralda falls for. Antonino Sutera, who sparkles in roles like the Golden Idol and the Bluebird, was suitably mean as Frollo, the lecherous Archdeacon of Notre Dame. So, all in all, the evening was saved, though 2,000 people are still waiting to see what Ivan Vasiliev can do with this role. 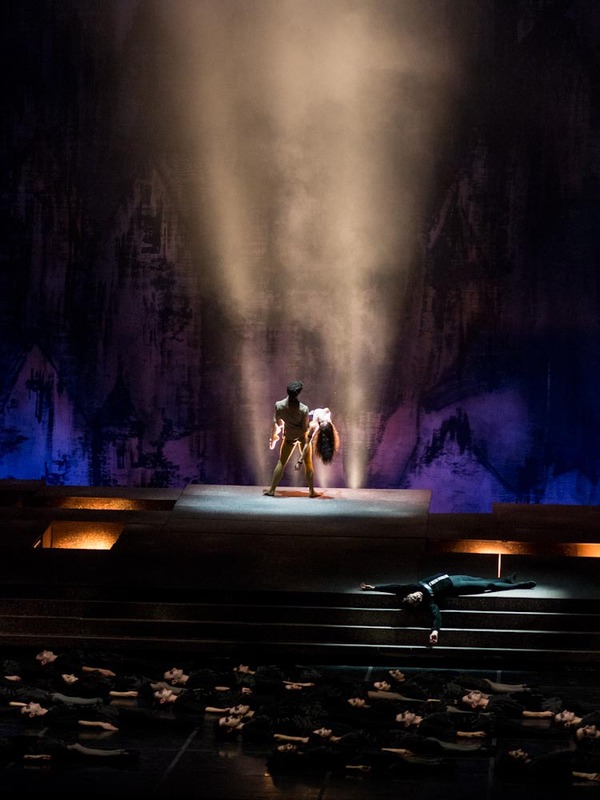 Photos: from top, Claudio Coviello as Quasimodo; Coviello with Petra Conti as Esmeralda; Eris Nezha, Coviello, Conti and Antonino Sutera.